The vacuum brewed coffee makers , also called siphon coffee makers, were very popular in North America until the 1960’s. It is so named because water is siphoned up from one container into another and must pass through the coffee grounds on its journey. If you ever visit Asian coffee shops, you’ll see many that still make coffee in this fashion. Brewing coffee with a siphon set up is fun and can put on an entertaining show for guests or customers. (Jump to the video to see this being made). It’s also perfect for light and medium roast coffee or coffees where you want to extract more of the essences of the coffee flavors, such as the most expensive coffee, or the Hawaiian coffee. The bottom vessel is sometimes made of metal though glass is common. It is the one that is heated and the top vessel is nearly always made of glass. The whole set up looks particularly fragile, but it does make a good cup of coffee. But it’s definitely not suited to those who are clumsy in the kitchen! There are several variations nowadays: balancing siphon coffee makers with two jugs, one on either side of a large metal balance. There are some modern variations, one especially that I like for its stylish appearance is called the ‘Kahva’. This is one of the better coffee siphon videos on Youtube because it shows the entire siphon coffee maker and how siphon coffee is actually made. Let me know what you think! The principles of making siphon coffee aren’t much different: cold water, and ground coffee in; delicious hot coffee out! To make siphon coffee you first put freshly ground coffee in the top vessel and water in the bottom one. Then water is heated with the application of heat to the bottom vessel. Siphon coffee pots come with an alcohol or butane burner that is placed under the bottom of the pots and continues to heat the water. Many coffee shops have a gas countertop that can make up to five or six pots at one time. Turn on the burner and heat the water. Don’t turn the heat up too high, but you should see bubbles in a few minutes as the water nears maximum temperature. Keep the water bubbling until it’s almost gone! As the water heats, the pressure forces the hot water up through a narrow pipe. Once in the top chamber, it mixes with the coffee grounds. Since heat isn’t directly applied to the coffee grounds or the resulting mixture, the coffee produced in the top chamber is usually very good. Once the water chamber is empty, you should turn off the burner or heat source at once. As the bottom part of the pot assembly cools, the air contracts and allows the brewed coffee to be drawn back down through the same pipe. The coffee is filtered on the way down, so that the coffee grounds don’t end up in the drink. I also noticed that the coffee shops don’t pour all the coffee into your cup, to avoid putting some grounds in your drink. The last few teaspoons of coffee are discarded. Having drunk many cups from the local KeyCoffee Chain, I find that coffee made with a siphon coffee maker is much quite smooth, and flavorful. Somehow, the method of brewing the coffee produces a much nicer and richer cup of coffee than you’d expect. While this method isn’t suitable for starting off the day, you do need to watch it a little and turn off the heat at the right time, it makes a great talking point for a dinner party, or afternoon coffee! The entire process can be relaxing as you watch the coffee brew. Siphon coffee assemblies can be quite beautiful. You can choose one made entirely of glass or one that has a bottom pot made of metal. Naturally, you can get one that is very elaborate or stick with simplicity. There are even more modern variations that combine both form and function. It was invented in France and Germany in the mid 1800’s and was very popular throughout North America until the mid 1960’s. As manufacturers began making more drip coffee makers, the siphon models fell by the way. They were still widely used in Europe and in Asia (esp. Japan) where the pace of living is much more relaxed. Americans were just beginning to rush through their days and felt they wanted a method to brew coffee that did not require much attention or time. Siphon coffee makers are becoming popular once again, not only because of the drama of the presentation but for the taste of the coffee they brew. A siphon coffee maker will come with a filter and a new one will usually have a few replacements. There are cloth filters that can be re-used up to a hundred times if you maintain them properly. They should be cleaned right after they are used with a gentle brush under running water. Soaking it in an oxidized cleanser and boiling water will keep them looking nice. Some siphon coffee makers use paper filters; some use glass filters. Glass filters are tubes with a slightly rough, bulbous middle that traps the coffee grounds but allows coffee to flow through. 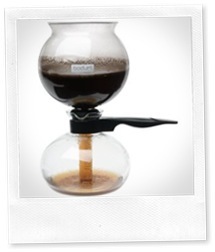 Some say that glass filtered siphon coffee makers are best but they do allow some sediment to enter the coffee. You will also find some siphon coffee makers with nylon mesh filters that are very effective but easily torn if you’re not careful. At the moment, Amazon only offers a variety of brands of traditional Siphon Coffee Brewers , and the prices aren’t exactly cheap: Bodum and Yama are both worth checking out. Do see out what else they have, you might see even more brands. One word of warning: if you buy a glass assembly, handle with great care! The large bulbs or vessels can be easily broken if they are knocked, dropped or carelessly banged against other dishes! Also, do make sure that the one you buy can be washed in a dishwasher. Otherwise, you’ll have to wash it carefully by hand! Get coffee ground for a drip coffee maker if you’re planning to use this kind of machine. You’ll need the grounds to soak a little in the hot water. They’ll give off a better flavor otherwise. If your grind is too fine, you may find it brews a little quickly and there is sediment in your coffee. If you’ve never tried siphon coffee, for your first cup, go to the local coffee house, and order a cup of siphon coffee. You’ll get to watch the entire process first hand, and ask lots of question.